The 3-star Hotel Relais Acropolis Nice has 42 contemporary-style rooms, all air-conditioned and non-smoking. The hotel provides Double, Twin and Superior Rooms. The decoration varies according to the floor. Pink and beige colors on the 1st and 2nd floors, anis and gray on the 3rd and 4th floors. 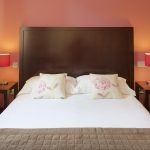 The 3-star Hotel Relais Acropolis Nice has 2 rooms adapted for people with reduced mobility. On request: cot and high chair, safe deposit boxes at reception.